The BBPA is where Aptitude Meets Opportunity. The Black Business and Professional Association helps the next generation of Black Excellence through a series of Programs and Events designed specifically to help youth through senior Black Business Professionals achieve goals and move their careers forward. Donating to the BBPA helps our community become its best and pass those skills on to the next generation. 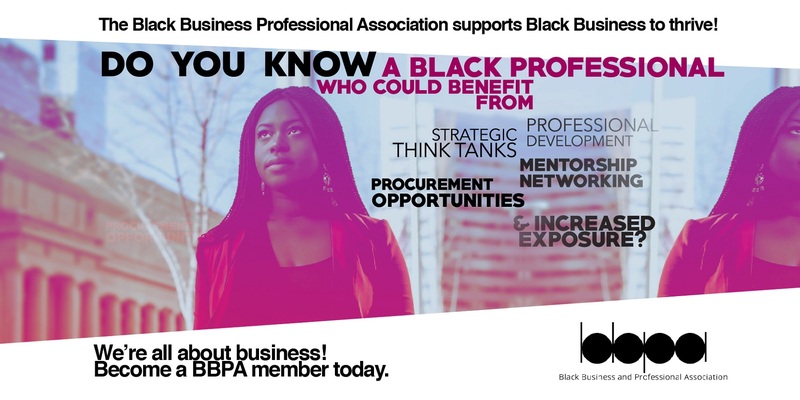 With 6 categories of membership (Full-time student, Young Professional, General, Family, Senior, Business) the BBPA Business Membership connects you exclusively with your specific demographic and target audience to market your product or service. Business Members are featured in our bi-weekly newsletter, under “Business Spotlight”, highlighting your business’s noteworthy accomplishments and linking to your company profile. Your business will also appear in a business spotlight on our website for one month. Three times a year, the BBPA gives you access to communicate to members through our database. Tell our members about any upcoming special event, service or new product offered by your company. Promote your business at our events and meet future mentors, clients, or partners for a better price. We invite all our business members to participate in our many volunteer opportunities to develop the future of tomorrow’s leaders. If you are interested in becoming a mentor or simply sharing a few words at one of our workshops, please contact our office. Key networking opportunities with Toronto Board of Trade and other BBPA partners.